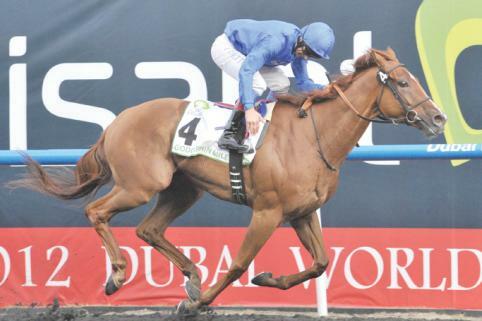 A well-balanced field squares up at the Meydan Racecourse for the Godolphin Mile on Saturday. With 2012 renewal winner African Story moving to the title race in the Dubai World Cup Night, several challengers line up to claim the honours. With a purse of $1 million, this mile is getting a lot interest as unbeaten South African star Soft Rain Falling faces his biggest challenge to date, with Surfer also attracting many punters with his current price of 10/1. The best place to have a bet on the race is with Bet365.com, which is where the odds below have been taken from, and will be updating these odds as they fluctuate as we get closer to the race. Surfer jockey Richard Mullen took his horse for his final piece of work on Monday and declared himself pleased with the Surfer’s preparation, adding that he has been steadily improving and that his early season win has given him a lot of confidence. Coupled with a good draw, Surfer is an interesting bet for Saturday’s race. The Satish Seemar trained horse has been dropped back from 1900m and 2000m races, where it was believed that his best racing came in the opening mile. It is to be noted that he covered more ground than his margins of defeat in that distance to some very impressive horses, and the consistent local runner is looking a very good chance in this race. In order to claim the race he will have to come to terms with Soft Rain Falling. The unbeaten colt is one of the most exciting racers at this Dubai World Cup, and this may very well be the biggest test of this four year old’s career. He has claimed two victories away from home shores, most recently in the UAE Two Thousand Guineas and the Trial for that race before it, also run over a mile, which is believed to be about the distance where his pace will carry him. He stormed to victory in those races, and with 2005 winning trainer Mike de Kock at the helm, he will no doubt have been prepared well for this race. The only thing that may keep the punters away from are the relatively short odds, but expect him to be there or thereabouts come the finish line. Elsewhere, Moonlight In Paris would likely have been a very good pick had he drawn better. The impressive Firebreak Stakes winner is clearly talented, but with the wide berth, he will be hard pressed to repeat African Story’s victory from last year, which is the horse he is effectively replacing. Fan favourite Barbecue Eddie often comes up short when coming up against form horses from the continent at this stage of the season, and he wasn’t very well into his stride in the early races this season. He had a bad race last time out, but in this well-balanced field, if his tactics are played right and is run as he was for his Maktoum Challenge win, may come through well. German horse Zazou was fifth in the in World Cup last year, and was the Cirrus Des Aigles winner a year ago, but has since not won a race and was beaten in that race this year already. Sarkiyla has shown a liking for quick ground and the Meydan surface might well suit her. At 14/1 she looks a decent bet, as she is unexposed and has good European form as well. The third race favourite is a consistent Meydan performer, and has raced predominantly on the turf deck in Dubai, but has been below his best this season. The second race favourite, Penitent, has improved recently, but has been winning mainly weaker races in Europe, and it is difficult to see him living up to the second favourite tag. If you’re looking for an outsider, Haatheq, at 50/1 is very highly priced. His trainer Ali Rashid Al Raihe believes that he could become a contender for the Dubai World Cup next season. He won the Jebel Ali Stakes over 1800m in 2011, and since then the horse has shown a lot of maturity, winning the 1600m Shadwell Conditions at the end of last year, following that up with another victory in January. Admittedly, he did well to finish in fifth in this race last year, but this year’s renewal is arguably not as strong as last year’s. It’s a long shot, but you will have seen many worse horses at 50/1. The ideal place to have a bet on the race is at Bet365.com, where you will find the best odds on the race. When visiting Bet365.com, click ‘Horse Racing’ in the left sidebar and scroll down to the Antepost section of the page, where you will find all the markets for this race. The Godolphin Mile is run at the Meydan Racecourse in Dubai and features in the Dubai World Cup Night. Visit the race’s wiki page to find out more.